As a few of you might have seen via our tweets over the weekend, Cyclops, Ashley and myself spent a bit of time waiting in line for tacos. 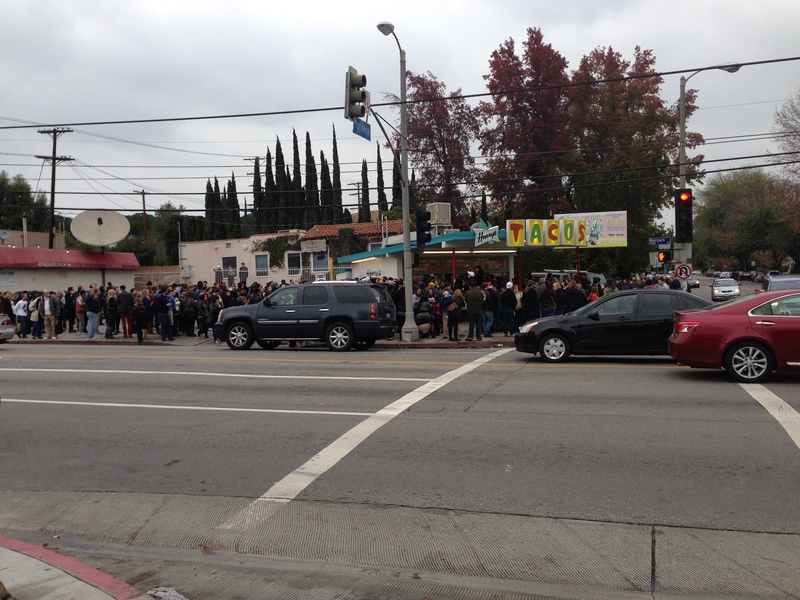 Why would someone wait in line for tacos you ask? Well this particular taco stand, Henry’s Tacos, has been a staple of the Valley (suburb of LA for those who aren’t natives) for 51 years and just happens to be right down the street from where I reside. It was built by Henry Comstock in 1961, and it preceded the first Taco Bell and was one of the first “gringo” taco stands in the LA area. Going to school in San Diego I was never a stranger to a good taco stand but for some reason I had never paid Henry’s a visit, it was always on my to do list but one thing or the other always got in my way. That was why I was saddened to hear last week that Henry’s was being forced to close it’s doors. I wasn’t the only one who was devastated by the news, LA natives, Aaron Paul, Elijah Wood and George Lopez decided to take a stand and try to keep this landmark open. They sent out a S.O.S. to their fans and guess what, the fans responded. Fans of the stars and Henry’s tacos came out in drones to take pictures with their favorite hobbit or stand in line for hours for a burrito. In a stalker move I was able to snap a shot of Elijah Wood and his adoring fans. While I didn’t get a shot, Aaron Paul was there for hours taking pictures, signing autographs and throwing out blue bags of crystal meth (ok probably just pop rocks) but still funny. After almost 2 hours in line the three of us got our tacos and they were delicious! Not sure if Henry’s Tacos will be saved but it was cool to see such a disjointed city come together for a good cause.